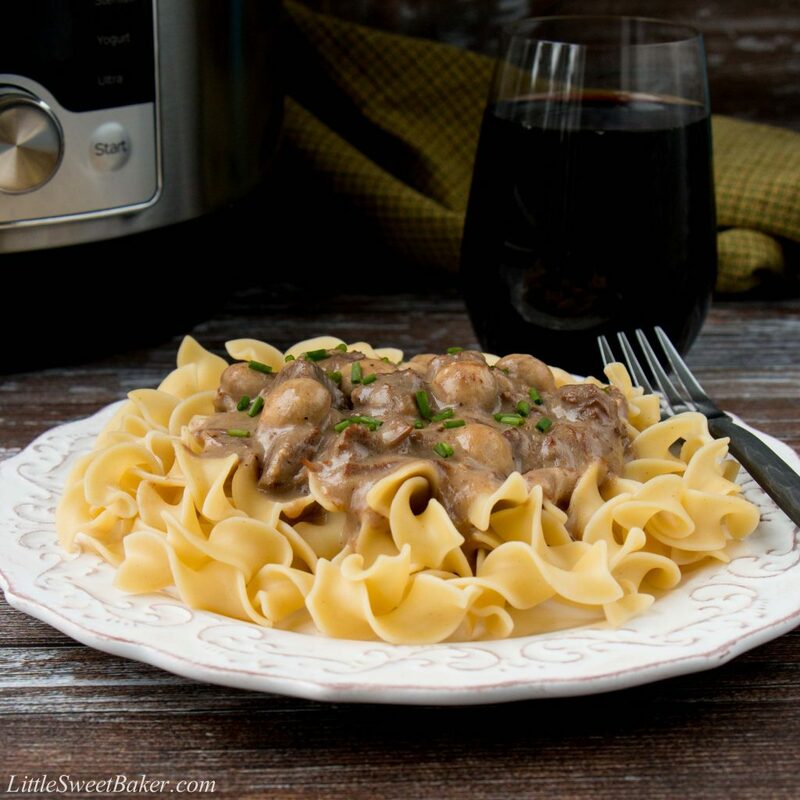 This easy beef stroganoff recipe features succulent chunks of beef in a creamy mushroom gravy. Cooking this dish in an Instant Pot makes the meat so tender and creates the most flavorful sauce you can imagine. 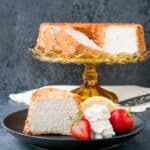 I know this recipe has nothing to do with baking or desserts, but I thought I would share it simply because it’s such an easy and convenient meal that has become a favorite in our house. 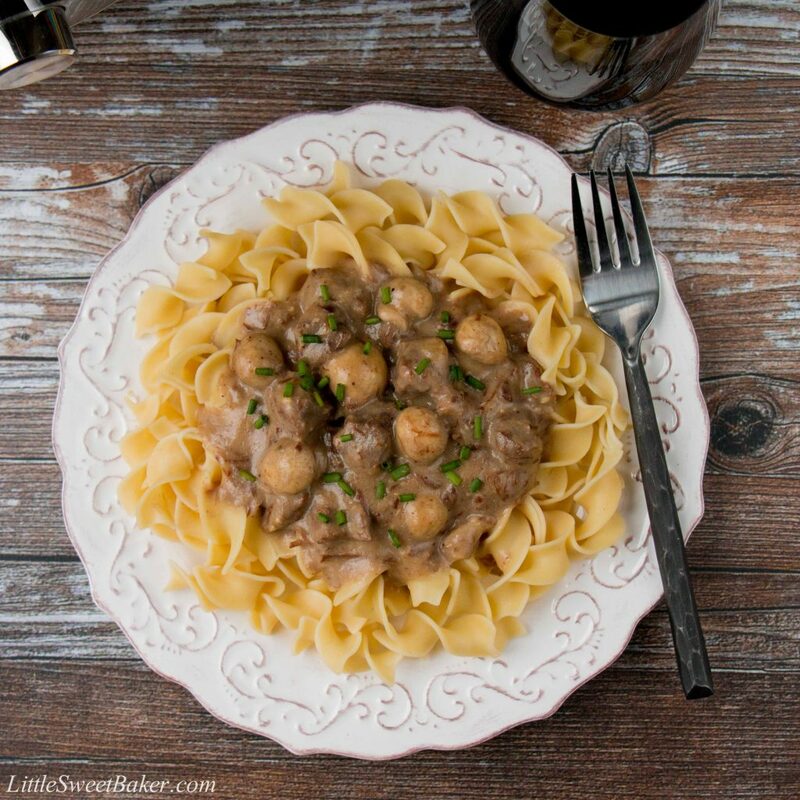 So from one busy mom/individual to another, here’s a hearty and wholesome dish that can easily be prepared as a simple weeknight supper or fancy weekend dinner paired with a nice bottle of wine. 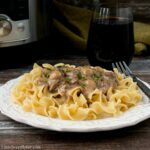 What I like about this recipe from Ashley of I Don’t Have Time For That is everything is prepared in an Instant Pot. From browning the meat, to sautéing the onions and garlic, to making the sauce, it’s all done in one pot. This recipe is also simple in its ingredients. It’s not over seasoned with tons of spices, so it’s great for kids. 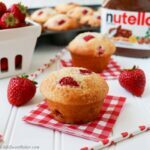 The flavor is just right with a minimal amount of ingredients. 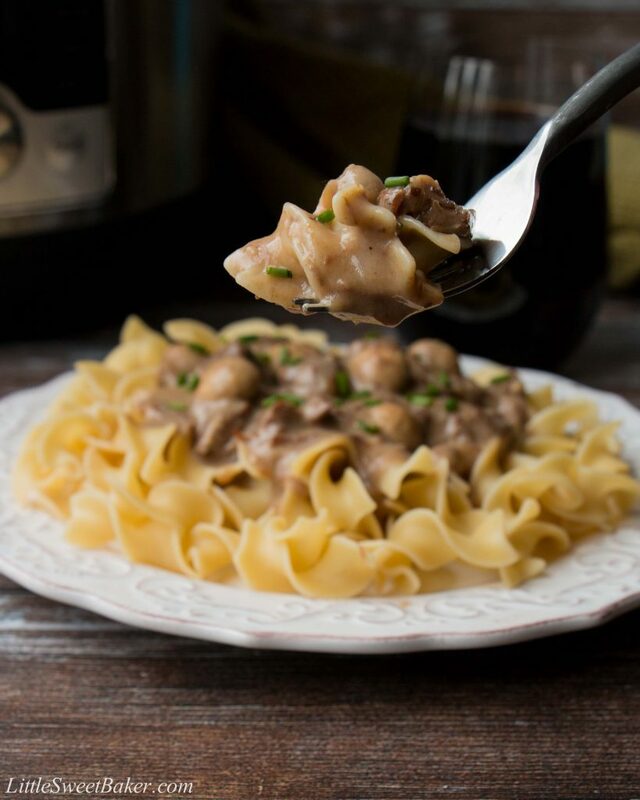 This beef stroganoff makes for a delicious and satisfying meal. It’s packed with soft and tender pieces of beef, and juicy button mushrooms in a rich and tangy meat sauce. Set your Instant Pot to Sauté setting and add butter. Add beef and cook for about 3-5 minutes until beef is browned on each side. Scoop out the beef and set aside. Add the onions and garlic, and cook for about 2 more minutes. Add beef broth and worchester sauce. De-glaze the bottom of the pot by scraping all the brown bits off. Add beef back in. Place the lid on the Instant Pot. Select the “Meat/Stew” setting on the Instant Pot and set the timer for 30 minutes. Make sure the pressure release valve is in the sealing position. Meanwhile, prepare noodles or rice. When done, quick release the pressure valve, open up the lid carefully, and add mushrooms, sour cream, mustard, and cornstarch slurry. Set the Instant Pot to Saute on low temp. Stir and let it simmer for about 10 minutes or until the mushrooms are cooked through. Add more salt and pepper to taste if needed. Serve with noodles or rice.